Pope Francis has granted Minor Basilica status to the Catholic National Shrine of Our Lady at Walsingham in North Norfolk. The rare designation is given by the Holy Father to places of worship which are of particular historical significance. The Pope's decree was announced at Walsingham, known as England's Nazareth, at the feast of the Holy Family on Sunday December 27, by Bishop Alan Hopes, the Bishop of East Anglia. The title has been granted to the Slipper Chapel, the Chapel of Reconciliation and the Domain. Making the announcement, Bishop Alan said: "The Holy See's recognition of the importance of the church in Walsingham is a recognition of the growth and witness of the Shrine over these many years since its re-establishment after its destruction during the period of the Reformation, for its constant witness to the importance of marriage and family life and its pastoral care of the tens of thousands of pilgrims who make their journey to the Shrine every year. "It has also come at a very important moment in the life of the Shrine as it seeks to develop and refurbish its facilities in the light of the ever growing number of pilgrims, a work being led by Mgr John Armitage, the recently appointed Rector of the Shrine. "I am quite sure that this moment will bring many blessings and graces to all pilgrims in the coming years." Mgr John Armitage, Rector of the Shrine of Our Lady, said: "This is wonderful news because it represents so much of what has been happening in the Shrine for so long. It's a recognition by the Holy Father of the long history of this shrine. "It's recognition of the remarkable devotion, particularly of the people who work here, the volunteers and all the loyal pilgrims who come from so far, for so often and from such great distances." The Bishop of Norwich, Rt Rev Graham James, said: "In a BBC survey nine years ago Walsingham was given the accolade of being England's most spiritual place.Now the Pope has added to the honour in which Walsingham is held.Anglicans as well as Roman Catholics come to Walsingham in big numbers and the relationship between the two shrines is close and supportive.I came first to Walsingham as a pilgrim in 1971, and I hope the new status the Pope has granted Walsingham will encourage many more people to discover the spiritual treasures of England's Nazareth." The shrine dates back to the 11th century, when the Virgin Mary appeared in a vision to the then lady of the manor, Richeldis de Faverches, who prayed that she might undertake some special work in honour of Our Lady. In answer to her prayer, the Virgin Mary led her in spirit to Nazareth, showed her the house where the Annunciation (when the Angel Gabriel told Mary she would give birth to Jesus) occurred, and asked her to build a replica in Walsingham to serve as a perpetual memorial. Minor Basilica status has only previously been awarded to three locations in Britain – Corpus Christi in Manchester, Downside Abbey in Somerset and St Chad's Cathedral in Birmingham being the others. 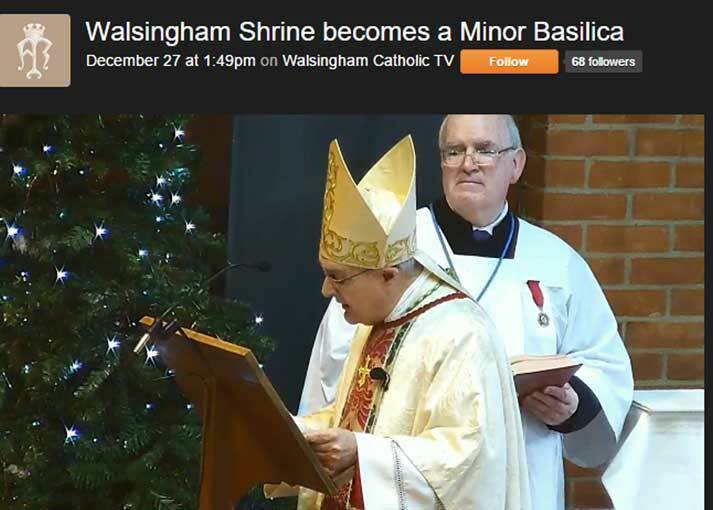 Walsingham is the first to be given such status since 1941. Walsingham Pilgrimage Co-ordinator, Julian Foord, spoke to Radio Norfolk about the Minor Basilica, click here to hear it, starting at 1hr 39mins, until Februay 10. Pictured above are pilgrims at a recent Dowry of Mary pilgrimage at the Catholic National Shrine of Our Lady at Walsingham.